Here are the first three pages of Zodiac: Leo. For this comic / illustrated poem I decided to do singular illustration for each page. I suppose you could say that I’m still nervous about my abilities to render a full page illustration so I wanted to do something that would let me inlay an illustration over something like a physical object. That way I can focus on a smaller illustration and practice some textures. 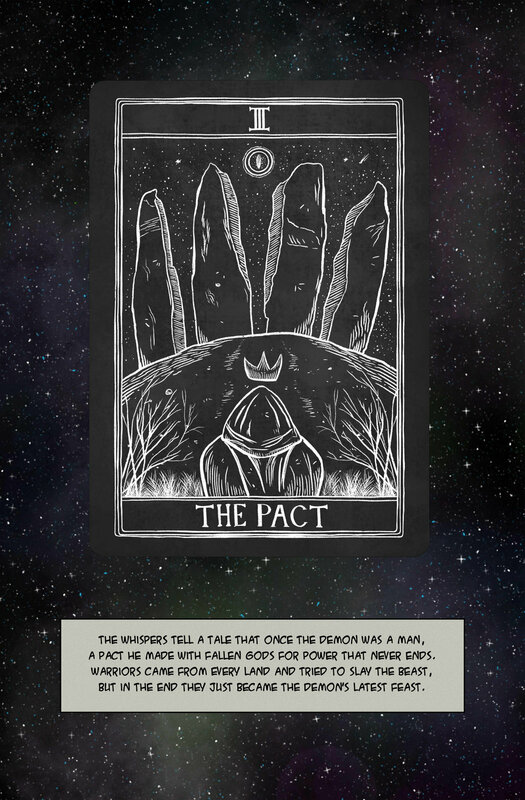 I settled on a series of thirteen tarot cards. Once I got the basic card shape, design, and texture, I could go ahead and start brainstorming each illustration. The tools largely inform the final product, so when I started using Procreate’s default Dry Ink brush and saw what an interesting woodcut-like drawing it created, I ran with it. The lettering on the cards are all hand drawn in Procreate. I wanted something that looked like an old handmade type set of some kind. So after I created a letter, I duplicated it for each other instance, that way there was a consistency in the type. Drawing with white ink on a black background makes for an interesting hurdle in that you’re basically drawing shadows as highlights. So there’s a bit of reverse thinking there so you aren’t trying to shade your drawing with what are actually highlights. It’s confusing. The dialog boxes with the poem in them were added with Affinity Designer on the iPad Pro. Designer is a program akin to Adobe Illustrator and I’m looking forward to learning more of the ins and outs so it will improve my overall comic book design. So those are the first three pages from Leo. I hope you guys enjoyed them. You can see the rest on Gumroad!